Joyce Nelson of The Nelson Family’s Dugan Road Creamery tends her calf Adam. URBANA — Joyce Nelson of Dugan Road Creamery in Urbana admits that she prefers the micro-dairy life, as opposed to her previous dairy farm. And with low milk prices and high feed costs, who could blame her? “It’s not a good situation (for dairy farms),” said Nelson. According to a recent Ohio State Extension article, Ohio dairy farmers have been leaving the business at a higher than usual rate because they’ve been struggling with lower milk prices and reduced revenue because the supply of dairy products has outstripped the demand. In the summer of 2016 Nelson and her husband, Chris, sold all of their 50 cows except for one because of economic reasons and the struggling dairy industry. But they couldn’t live without cows for long. “We couldn’t handle it. We missed the cows too much,” she said. Six months after they sold their cows, they decided to start a micro-dairy. Now they have seven Holstein cows at their creamery. Joyce and Chris Nelson opened The Nelson Family’s Dugan Road Creamery in April 2017, offering flavored milk, white milk, cheese curds, cream cheeses in various flavors, along with hand-stretched mozzarella cheese and Greek-style yogurt cheeses. Their creamery is located on Dugan Road in Urbana. The Nelsons have been on this farm for 32 years. Joyce and Chris moved to Ohio from Idaho in 1988, where they were milking 300 cows. At their micro-dairy, they sell to local stores, including Steve’s Market & Deli (Urbana and DeGraff), Davis Meats (Sidney), Sunset Meat Market (Piqua), Haren’s Market (Troy) and Rosewood Grocery (Rosewood). Nelson admitted that she and her husband had an easy transition since they already had much of the infrastructure. The most significant expense was the pasteurizing equipment needed for the creamery. Before they had been selling their milk directly to milk processors. Now they can better control their prices and sell locally. “I much prefer the micro-dairy,” said Nelson. Before they started their creamery, the Nelsons visited many micro-dairies in Maryland. She said the Ohio Department of Agriculture was encouraging during the process of starting the micro-dairy. She added that the health inspectors were also helpful. Chris and Joyce work and operate the micro dairy, with some help from their children when they’re home from school. The Nelsons pasteurize, cool and bottle their milk and other products themselves. A cow produces about six gallons of milk per milking, and the cows are milked twice per day. The Nelsons have used sand instead of hay for their cows to stand on for 15 years now. Sand doen’t hold bacteria like hay can do. The sand also holds in heat. “Antibiotics are never in your milk,” said Nelson, explaining that they have to test their milk three times before it’s sold. They also have three inspectors who visit the farm every month. The Nelsons produce creamline milk, which means that the fat from the milk is not broken up through homogenization. Therefore, milk from Dugan Road Creamery needs to be shaken before drinking. Nelson said the fat that’s not broken up helps the stomach process the milk. “You still get the same 11 nutrients in colored milk as you do in white,” she said, adding that the flavored milk does add some calories. “Cows need people, and people need cows,” said Nelson. Her philosophy, which she instilled into her four children on the farm, is that you should touch every animal on the farm every day. She said that dairy farming is a perfect way to raise children, as it teaches them responsibility. “They learn that the decisions they make can be life and death situations,” she said. She supports bottle-feeding every calf, as you can look at a cow’s eyes, take a close look to see if it’s healthy or if it’s getting sick. Scours and pneumonia are common sicknesses in calves. “We have a whole generation of kids who aren’t drinking as much milk as they should be,” Nelson said, adding that many schools do not have the capability to keep enough milk cold to offer to students at school. Nelson has been a 4-H advisor for 32 years and the Nelsons host Farm Days for kids at their creamery once a year. She also drives a school bus full time, which she said works with her schedule at the creamery. 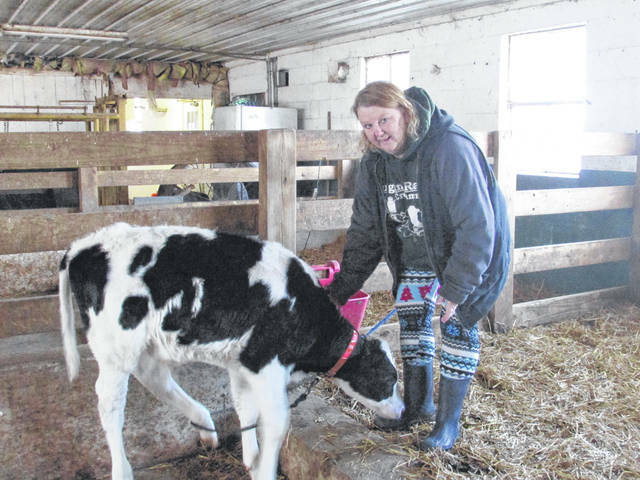 https://www.sidneydailynews.com/wp-content/uploads/sites/47/2019/01/web1_JoyceNelsonandAdamCow.jpgJoyce Nelson of The Nelson Family’s Dugan Road Creamery tends her calf Adam.